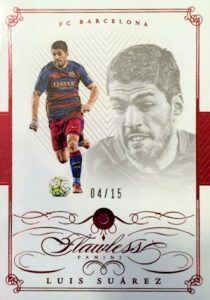 The first major soccer release to fall in the ultra high-end collecting realm, 2016 Panini Flawless Soccer has the potential to be one of the biggest modern sets of all-time. Each box incldues six autographs, two relics and two gem cards. 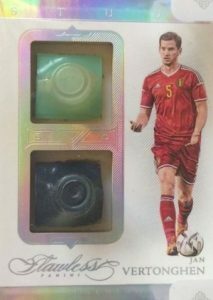 Long rumored and previously teased in 2015, Panini directly referenced the product at the 2016 Industry Summit and live card images soon followed. 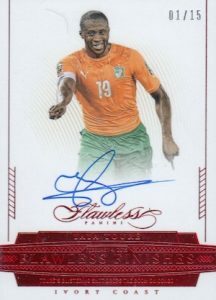 While the full checklist will not be available until much closer to release, images showed a mix of Flawless designs and world class players. 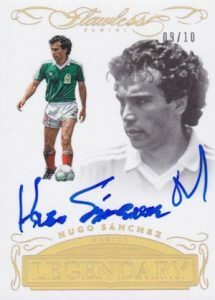 All cards are numbered to 25 or less and feature match-worn relics, autographs or authentic gemstones. 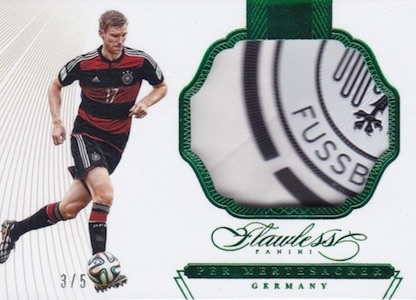 The base set incldues the biggest names and clubs/national teams in the world with an added diamond. There will also be limited Ruby, Sapphire, Emerald and other Diamond parallels. 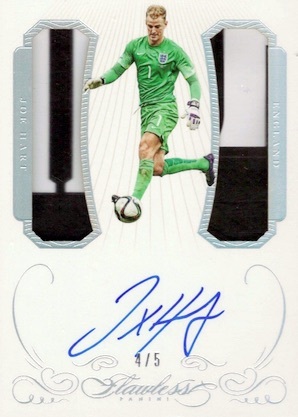 Boasting on-card autographs, the signed options in 2016 Panini Flawless Soccer are quite impressive. 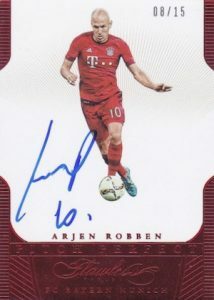 This includes Flawless Finishes that honor notable scores with a signature and International Icons Signatures and Legendary Signatures featuring top current and former players. 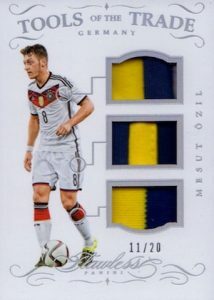 Adding match-worn memorabilia, Sole of Game Signatures pair an autograph with cleat relics, while Dual Patch Autographs and Momentous Autographs Memorabilia double the excitement with two patch swatches in addition to the signature. More options include Studs that feature two studs straight from a match-worn cleat and Tools of the Trade that includes dual swatches from various gear relics, including pieces from jerseys, shorts, socks, gloves or cleats. There is also a Tools of the Trade Triple Relic version. Beyond the base versions of each insert, collectors can find several limited parallels, including Ruby, Gold, Emerald and Black, for many of the cards. 152 cards. Serial numbered #/20. All base subjects not found across all parallels. View the spreadsheet for specific print runs. View the spreadsheet for specific print runs. 59 cards. Serial numbered #/25. Even though very little is known, this has to be 5 stars. it’s going to be enormous!!!! It’s not just high-end. It’s Super High-End! I agree I cannot wait till next week ?? This product looks truly amazing….but I’m a French fan and I’m not really happy (Again!!) 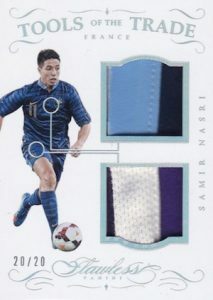 with this checklist…Seriously Panini, it’s a joke : Nasri/Benzema and a bunch of base cards. Why? Platini? Zidane? Pogba? Griezmann? Henry? Canto? Again, I will spend my money on Futera.. I thought about buying a spot in break, but the hit or miss aspect is too much in this product for the price you pay. 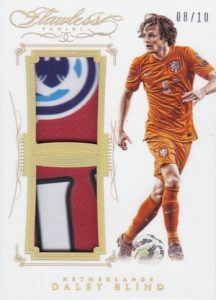 Yeah they got Messi and Cristiano Ronaldo patches/autos, but how about Rooney, Zidane, Fernando Torres, Thomas Muller, to just name few and etc etc…?? 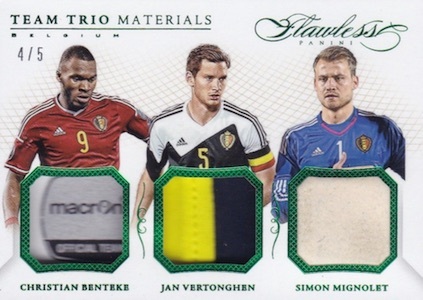 But then again, I am still curious to see how much those Messi cards will be on eBay. GL to those buying it!! Great product, predictable checklist, I think they could have added more new names considering the price point. I must ask, when did Cobi Jones become a legend?